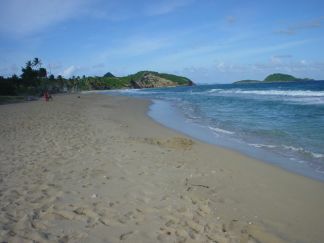 On national holidays Bathway Beach is by far be the most festive of all Grenada beaches. Food, drinks, music, and lots of people. If you happen to be in Grenada on a national holiday and you are up to it, then pack the cooler and head north for a day of fun and frolic. But national holidays aside, you will find bathway beach just the way we found it, when we stopped while on our island tour … almost deserted. There are no water sports, or dive shops on Bathway. So bring along your own fun. If your idea of fun isjust a relaxing day on the sand, reading a book, and taking a swim … you will feel right at home. There are normally a couple vendors selling light refresments. But I will highly reccommend that youalso bring along a cooler, and snacks. The perfect day trip will be to first stop off at Morne Fendue Plantation House for lunch. And then head down to bathway beach. Be extra careful swimming on this beach. Under no circumstance should you go beyond the protective reef. There are very strong currents beyond these reefs … even expert local swimmers do not venture beyond them. In fact the best thing to do is seek advice from one of the local vendors on which areas are the safestto swim … most of them will tell you the same thing Swim in front of the reefs , but actually hearing it again can be reassuring. I love Bathway Beach because it is wild, romantic and secluded. 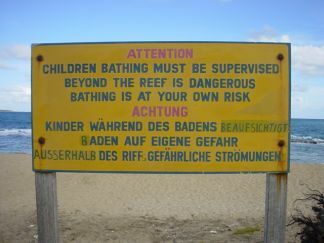 The beach is very safe especially for children, old people and non swimmers. I do not like too much of man made constructions like Hotels, Restaurants, Discos paved streets etc near to the beach. It is almost never overcrowded. The country environment gives it a special appeal and wants you to come back. The beach used to be unspoilt until someone went and spoiled it by putting a house on it.